Our pastor began a new series Sunday on Jonah. He is taking it slow and luxuriating in our verse-by-verse exposition, which means I am too. Don’t take for granted both the real and spiritual slings and arrows that are flung against your pastor for being brave in preaching the unvarnished truth to a skeptical world. Be sure to pray for him for his spiritual, physical, and emotional health and well being. Here is the sermon if you’d like to listen. It was delivered at North Avenue Church and its upload is dated June 7, 2017. I love the prophets and I love the book of Jonah. So on the Monday after our pastor delivered the sermon I listened to four sermons on Jonah, and on Tuesday I listened to one more. There are multiple layers in Jonah, lots of deep, rich aspects one could go in the journey through this wonderful book. I know our pastor will bring out many truths as we sit under his preaching throughout the summer. But being practical and being logical, and having been a mariner in my younger days, there was one question that bugged me. I could not find an answer to it in any sermon, commentary, or study Bible note. Until it hit me. It hit me like a thought-comet the Holy Spirit flung at my mind. The LORD hurled a great wind on the sea and there was a great storm on the sea so that the ship was about to break up. 5Then the sailors became afraid and every man cried to his god, and they threw the cargo which was in the ship into the sea to lighten it for them. But Jonah had gone below into the hold of the ship, lain down and fallen sound asleep. (Jonah 1:4-5). The storm was rough. The word ‘hurled’ in describing the Lord’s hurling of a storm is the same word that was used to describe King Saul’s hurling of the spear to David. This was not an ordinary storm, and the sailors knew it. Mariners don’t exaggerate. If anything, they understate the height of the waves or the intensity of the storm. Later, with a cup of grog in hand, they might say, “Aye, the boat bounced a bit.” Or “The waves were stirring all right.” Sailors are tough. So it’s notable that the sailors were afraid. The word in Hebrew is terrified, also reverent. They knew it was some god that was doing this and they were religiously afraid. They prayed to whichever god they followed to appease him or her. Before throwing over the cargo, the sailors would have been shortening sail. Billowing sails in a storm blow out and become tatters. So they’d reef the main and take in the jib. When that doesn’t work they take in the main sail completely and go under bare poles. They would throw the attached anchor overboard to help stabilize the boat. They would shift ballast in the hold. They would cut the dinghy away if they had one. Then they would throw over the cargo. Last, they pray, because foxholes are filled with praying people. 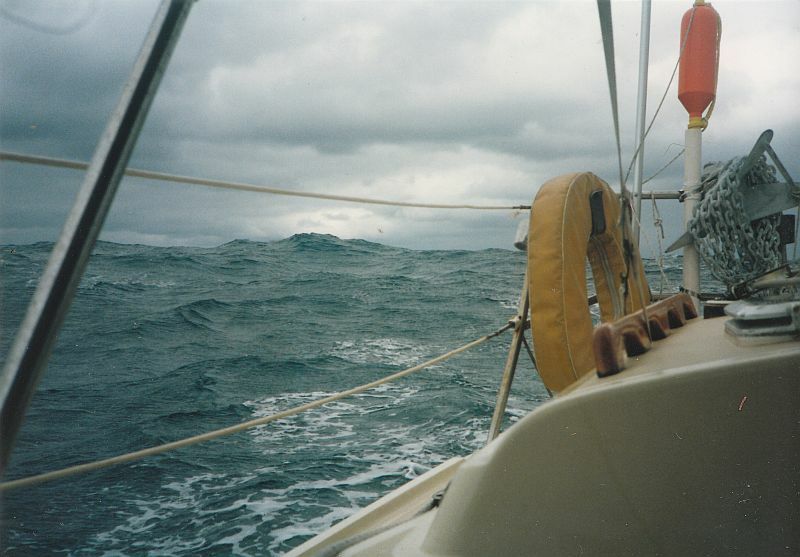 Activity on a boat during a storm is at a pitched and chaotic level. It is also loud. In winds that high, the waves roar, and even the spray is loud. The spray and foam mix with the air and it’s hard to breathe, you’re breathing water half the time. The high winds whistle and beat against the mast and buffet the sailors. The waves slam and beat against the boat, which in turn creaks and makes all manner of tortured sounds. Mariners have to scream to be heard when they give directions, and when the wind becomes too loud, they just use hand gestures. Sometimes that doesn’t even work because darkness and spray obscure all sight. Anything on deck or below deck not in place or lashed down moves, skids, flings around like crazed maniacal ping pong balls. Though the above activities are not mentioned, that is what they would have been doing. When the usual marine protocols failed, the sailors resorted to a last resort: throwing the cargo overboard. This lightens the boat and makes it bob in the water higher, so the tall waves have less chance to over-swamp the boat and capsize it or break it apart. Sailing with cargo is a money-making enterprise, and you do not want to anger the ship’s owner by having thrown over what amounts to his money. So when we read that the sailors threw over the cargo, this is very last resort. If you’re down below, sailors have to tie themselves in or raise the bunk boards, so they aren’t flung across the cabin like a rag doll. Against this backdrop, Jonah was asleep. Depending on the translation, scripture says not only that Jonah was sleeping, but he was fast asleep, sound asleep, in a heavy sleep, a deep sleep. How, how could Jonah sleep through all this? It bugged me. It was not normally possible to sleep that way during a storm as severe as described. I pondered this over and over again. It seemed an important juxtaposition, the sleeping prophet as the boat is almost sinking. Then it hit me. Jonah wanted to die. The book of Jonah is clear about this fact. It’s stated several times that Jonah wanted to die. He would rather die than obey God in evangelizing the Ninevites. At the least, when Jonah ran away disobeying God it was a usually a death warrant. Jonah would have been aware of the cost for disobedience in the Holy of Holies, and also Uzzah’s penalty for disobeying when he touched the ark. Jonah wanted to die as seen in Jonah 1:12 when he could have repented on deck and asked God’s forgiveness, but he chose instead to be thrown into the sea, to be tossed around like a peanut then drown alone. In Jonah 4:3 he explicitly said he wanted to die, rather than live. He said it again in Jonah 4:8. So four times we see Jonah acting in ways that showed or stated he was serious about dying. Elijah wanted to die because people were so bad. Jonah wanted to die because God was so good. People who are intent on death often suddenly display an eerie calm. As the sailors were above fighting the storm, what they were really fighting for was their lives. Not Jonah. He was not fighting for life, he was resigned to death. He fell asleep. Deeply. However potentially even more worrying is a sudden calmness, and many individuals who are contemplating suicide have a sense of resignation that can result in them acting very calm and even peaceful in the days leading up to their attempt. If they have gone from appearing excessively sad and exhibiting mood swings, to suddenly acting calm and peaceful then this can be a very dangerous sign and it’s important to look out for other signs that the calmness may not be all it seems. Jonah was serious about dying. He wasn’t exaggerating. It wasn’t hyperbole. It wasn’t an idiom. He really preferred death to obedience, death to being an instrument of God’s compassion and love toward the pagan and evil Ninevites. But he himself went a day’s journey into the wilderness and came and sat down under a broom tree. And he asked that he might die, saying, “It is enough; now, O LORD, take away my life, for I am no better than my fathers.” 5And he lay down and slept under a broom tree. (1 Kings 19:4-5a). Elijah’s sleep was a regular sleep, a completely different Hebrew word than Jonah’s deep sleep. Another difference is that Elijah wanted to die because people were so bad. Jonah wanted to die because God was so good. (Jonah 4:2-3). I wonder if Jonah spent three days in the belly of the fish rather than one day, or one minute, because he hoped to die again. Maybe as the fish swallowed him, he was thinking, “OK, this is convenient, no one lives in a fish, now I can die!” But when it didn’t happen and didn’t happen, and on a third day it didn’t happen, then Jonah prayed his prayer. I wonder if it was his stubbornness kept him inside a foul, airless, acidic, sewage, rotting belly of a fish for all those days, only praying when he realized the Lord was going to keep him alive no matter what. Sigh. So realizing the Lord was going to supernaturally keep him alive anyway, he prayed his famous prayer in Chapter 2 and was released. Because in chapter 4 he said two more times he still wanted to die. Who or what is your life ring? Who do you call for your S.O.S.? So that’s the story of the death-seeking Jonah. It tells us a lot about him on that boat, that he wanted to die rather than see thousands come to Christ. That he could sleep amid a hurricane. God dealt graciously and kindly toward Jonah. Should we not have compassion on the lost, as God seeks their salvation and is slow to anger, that all would repent? We were rebellious, once, too. The LORD is gracious and compassionate, slow to anger and rich in love. (Psalm 145:8).